ENCINITAS - One hundred dollars in cash and a free ice cream party - a youngster's dream. All they have to do is beat a chess expert in a speed match and the prize would be theirs. Sounds simple? Not. This is a bet members of an educational chess program have laid down thousands of times in elementary school throughout Orange County. They haven't lost yet. They are now placing that same bet with students at Cardiff and Ada W. Harris elementary schools in Encinitas. Whether they will finally meet their match remains to be seen. The bet is part of a promotion for a program called Academic Chess, which is designed to help students do better academically by applying skills learned and used in the game that was created by a bored king in India more than 3,000 years ago. Through chess, students can develop critical-thinking and problem-solving skills, increase their concentration levels and learn about sportsmanship, the group's founder Eric Hicks said. Cardiff School District Superintendent Richard Thome helped Hicks start the program in Orange County in 1994 while he was the assistant superintendent at the Capistrano Unified School District. "I have seen the results," Thome said. "Teachers have discovered skills in their students that they didn't recognize before. I will do what I can to help him expand the program down here." Ultimately, the group hopes to bring the program to every elementary school in San Diego County. Since its inception, the program has taught chess in more than 70 schools. 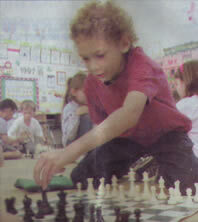 In-school chess instruction has also been added to the curriculum of Capistrano Unified School District. Thome said the school board recognized that chess teaches students to think logically and implement strategies using mathematics as a basis. Instructors visit six classes a day giving free basic chess lessons and educating youngsters on the history of chess. The non-profit group also offers hour-long, after-school individual lessons for children who wish to learn more about strategy. The individual instruction costs $48 for eight one-hour lessons and a chess set. Students meet once a week on campus immediately after school. Hicks suffered from attention deficit disorder and dropped out of high school with a 1.4 grade point average in the mid-1980s. He began playing chess on the boardwalk of Santa Monica and soon developed a passion for the game. Through chess, he developed concentration and focus, he said. "I realized that I was beating people who I thought were smarter than me," he said. Mastering the game gave him the confidence to enroll in junior college. From there, he went on to attend UC Berkeley, and graduated with honors. While attending UC Berkeley, Hicks wanted to share the educational success he gained through chess with other struggling students. He began teaching chess to inner-city children living in Oakland. "I found that kids who were having the most trouble in school and needed it the most were the ones who picked it up faster and were better at it," Hicks said. "It wasn't the kids who were 'gifted' children." He used "cool" teaching methods to keep students from writing off chess as a game for "nerds," he said. 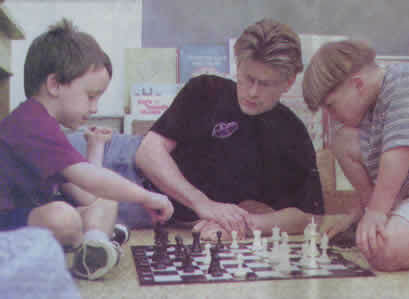 One of the schools Hicks taught chess at went on to win second in the state championship, defeating many schools that had organized chess teams for years. After graduation, Hicks moved to Orange County and worked as a video-game designer, but said he quickly realized that "video games were a complete waste of time and missed giving the kids a game of substance." In his spare time, he went to schools and taught students the rules of chess. He learned that chess had enormous benefits for all students, not just those struggling in school. Word of his chess tutelage quickly spread and Hicks found himself being overwhelmed by requests from schools. He began selecting a core group of chess professionals and started Academic Chess as a full-time job. "We just want to pass on our love for the game and help people realize the enormous benefits chess has to offer," he said. For years both Ada Harris and Cardiff have had chess teams, but the interest was minimal until the group began teaching at the schools, Thome said. The group will host a chess tournament every Friday from 6 to 9 pm at Ada Harris, 1508 Windsor Road.